On November 9th as the dust settled and we took in the Republican victory in the US elections, I hugged my daughter and told her, “WE will be ok. WE will be safe.” I reminded her that as a child I had lived through the Iranian revolution, where we had seen our lives upended. I insisted that those events – travel bans, arrests, families separated, assets frozen - would not take place in America, regardless of the rhetoric against Muslims or citizens of Muslim majority countries. In conversations with friends and family, who were anxious, we deployed dark humor but we did not overdo it. Rightly so, our sympathy lay with the undocumented women, men and children, who’d be at the mercy of the new sheriff in town. Compared to them, we were and are the lucky ones. Or so I thought. 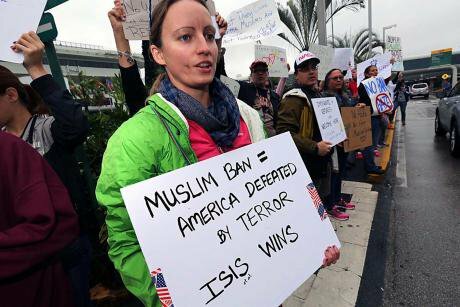 At 4.30 pm on January 26, 2017, President Trump signed an Executive Order that effectively bans the citizens of seven countries from visiting the United States. Iranians, Iraqis, Libyans, Syrians, Yemenis, Somalis and Sudanese who wish to travel to the US, regardless of whether they are refugees fleeing war and terror, students bringing their brilliance and talent to US universities, tourists wishing to spend their hard earned cash in the US, or parents, lovers, siblings and children hoping to visit their US based relatives, are barred. As they arrived at airports in the US, chaos ensued. People were arrested, interrogated, had their social media sites checked and some were deported. An Iraqi interpreter for the US army was cuffed for 17 hours. Elderly women in wheelchairs and young children were in the mix along with doctors and scientists. The US officials and Trump supporters claimed this is done for national security, but politics of the extreme right is driving this agenda. The initial statement was broad enough that it also dragged Green Card holders, i.e. legal permanent residents of the US into its draconian net. Even nationals of those seven countries, with other citizenship could be barred. For a while the silence of the UK government and others was simply deafening. Then Prime Minister Trudeau – Captain Canada – came out strongly supporting his dual citizens. Angela Merkel followed and Boris Johnson finally stated that the vast majority of UK citizens who were nationals of these seven countries were also exempt. But as of Sunday night, the US Department of Homeland Security has stated, while Green card holders would have right of entry they could be subject to ‘case-by-case’ determination. The outcry against this EO has been loud, proud, spontaneous and so very humane spilling out in airports across the country. The weekend’s heroes were the lawyers and judges who came out in droves and fought heroically for seemingly small but life-changing victories. They proved that the separation of powers and rule of law that are the foundations of democracy, do work. Judges across the country chastised the government for lacking legal grounds for barring entry to visa holders and legal residents. But they are small victories, as hundreds of people remain in detention. These events touch many of us directly as we have childhood memories of flight from revolution, war or dictatorship to new lives in the United States and Europe. The memory of upheaval and the fear of uncertainty may be burrowed deep in our psyches but it is never erased. Yet on election night when the Republican victory was announced, none of us imagined that those fears could be inflamed again here in the United States, where we live as legal residents or citizens. I did not imagine the possibility of ever again leaving my home for a 10-day trip and not being able to return for seven years, as happened when I was an 11 year old in Tehran. Yet these past few days that thought has crossed my mind. It is so unimaginable to consider packing up my home, that I dose it with humor, wondering who would water my plants and whether my children – who luckily are US citizens – would remember to take Myrtle our turtle back to their father’s home. The very thought of banning people from the United States is an anathema to the very essence and identity of this country. The beauty, exceptionalism and greatness of America compared to other countries, has always been its willingness to embrace and celebrate diversity and pluralism. European countries have democracy and liberty. They also have better education, infrastructure and health care. But they falter in their ability to fully embrace the multiculturalism that is the new norm of our world. America was formed and thrived on that very idea. If this is destroyed, than what is great about America? Coming from a president with a history of abuse against women, it is difficult not to see it as a punch in the face for Lady Liberty. When America catches the flu, the world catches pneumonia – as many of my colleagues say. So it was no surprise that this EO implicates so many others – not least the beleaguered but still relevant United Nations. If the visa ban is issued, than the state officials and citizens of these seven countries cannot attend UN meetings in New York. Given that the first to protest profoundly against the age of Trump were America’s women, and that the annual UN Commission on the Status of Women (CSW) is coming up in March, it is perhaps apt, that the first to also test and taste the ban will be women. That Yemenis, Iraqis and Syrians will be among the absentees is even more poignant. They are the invisible and unsung heroes of their countries. Through the Women’s Alliance for Security Leadership (WASL) which I spearhead, we know that these women are the few who dare to work for peace and equality, to provide relief and aid in the midst of war, to envision and work for the betterment of their societies in every way they can. They are perpetually at risk from violent armed movements and predatory governments. From Syria and Yemen to Iraq, Libya, Somalia and Sudan, women are at the literal frontlines of the struggle against Daesh and other extremist groups. They aren’t full of hot air and rabid rhetoric. They’re putting their own lives on the line to pull young men out of the clutches of these groups. Coming to the UN is their opportunity to inspire and show solidarity with each other, and share their expertise with the powerful states of the world. But herein lies the irony: in attempting to come to the UN – home of universal human rights – they will be barred by the extreme radicalism of one member state, that claims their exclusion is a means of preventing violent extremism. If Lewis Caroll were alive, he’d say the bananas are running the republic. We may be cynical about the UN, but now when so much that was built so carefully over years, is being destroyed so quickly, taking the UN for granted is a bad idea. Despite the shenanigans of many governments, the UN, in its very spirit and since its inception, has been about ‘we the people’, and rooted in the principles of the universality of human rights. The conferences where citizens get to meet, overcome prejudices, and convey their thoughts and solutions, are more necessary than ever in our collective history. The participation of women in matters of world peace and security – especially from countries affected by war and violence – is of particular and urgent importance. Even the crusty UN Security Council has acknowledged this, with not only the US, but also Russia and Theresa May’s UK issuing no less than eight resolutions calling for women’s full participation and representation in decision-making pertaining to war and peace. Yet the Trump administration’s EO will mean a unilateral and clearly arbitrary ban against women coming to the UN. It will be flouting the Security Council’s resolutions and thus against international law. Of course Mr. Trump’s coterie are also sharpening their knives against the entire United Nations infrastructure. And those who know the new President say his style of leadership is to create conflict among those around him. When he was a CEO it was among his own staff. Now he is president, it will be to pit one country against the other. António Guterres, the new UN Secretary-General – already much respected and with tremendous responsibility and expectation on his shoulders – has enough on his plate. But neither Guterres nor the UN General Assembly can stand in silence now that the EO is passed. It is an early warning sign of worse things to come, for the US and the world. Here in the US, individually and through our civic organizations, we continue to fight back. We understand that living in America – even as non-citizens – is about standing up for our own rights, while respecting those of others. It is advanced citizenship, like none other, with deep roots in the rule of law. But since January 20th, the rule of bad law is being seeded. We cannot let it take root and become normalized. And when the impact goes beyond the borders of the US, the world’s global institutions need to take a stand. So, on behalf of ‘we the peoples’, it is time for the United Nations to also stand against the so-called Muslim Ban, and to do so, before it is too late.